Honorary Director of the Fiona Elsey Cancer Research Institute. Professor George Kannourakis has been a practising medical oncologist and clinical haematologist in the Ballarat community since 1992. Previous placements include the Dana Farber Cancer Institute, Harvard University in Boston, where he worked as a Research Fellow, and he headed the Cancer Research Unit at Royal Children’s Hospital in Melbourne from 1990 – 1996. George was a Paediatric Haematologist and Oncologist prior to making the switch to adult Medical Oncology and Clinical Haematology. His research interests are in the biology of histiocytic disorders and translational research involving immunotherapy and clinical trials. Training in paediatric haematology and oncology commenced in 1981 at the Queen Victoria Medical Centre, and subsequently at the Royal Children’s Hospital, Melbourne. Training involved management of thalassaemia and related disorders, and acute management of haematological and oncological conditions. As Physician to the Oncology Clinic and subsequently Acting Haematologist/Oncologist, experience was obtained with the management of acute and chronic oncological problems as well as palliative care. Further training was obtained at the Dana Farber Cancer Institute in Boston between 1988-1990. On return from overseas in 1990, he was appointed as Haematologist/Oncologist with responsibility for the management of children with a wide range of haematological and oncological conditions including management of patients undergoing autologous and allogeneic bone marrow transplantation. Clinical contributions have been the initiation of G-CSF therapy in patients with glycogen storage 1b disease in Australia, participation in ANZCCSG clinical trials and providing an interface between clinical medicine and basic research. He was appointed to the International Advisory Board for the Severe Chronic Neutropenia International Registry in 1993. Initiation of innovative trial of differentiation therapy in a patient with erythroleukaemia using DMSO and erythropoietin. Experience in Medical Oncology was obtained at Dana Farber Cancer Institute and as Visiting Medical Oncologist at both the Base Hospital and St John of God Hospitals in Ballarat (1991 – 1996). From 1996 until 2003, appointment at Ballarat Health Services as Consultant Medical Oncologist, responsible for the management of patients with cancer at St. John of God Hospital. He currently practices at Ballarat Day Procedure Centre and has outreach clinics in Stawell and Horsham. For the services Professor Kannourakis has provided to the rural community he was awarded a Distinguished Rural Doctors Award. Research training commenced in 1976 with studies on the membrane proteins of normal, foetal and leukaemic cells under the supervision of Dr Maurice Cauchi in the Department of Pathology and Immunology at Monash University. These studies led to the award of a Bachelor of Medical Science with first class honours, and a number of publications. Further research training in cell biology was obtained as a Lady Latham Research Fellow in 1984, and as a National Health and Medical Research Council Postgraduate Scholar from 1985-1987 at the Walter and Eliza Hall Institute, Melbourne. This work was undertaken in Prof Donald Metcalf’s Unit, under the supervision of Prof Greg Johnson and resulted in the award of a PhD from the University ofMelbourne in 1989. Significant contributions from these doctoral studies included the identification and purification of human haemopoeitic progenitor and stem cells, the first description of the effects of recombinant colony-stimulating factors on single purified progenitor cells, and the identification of cells that enhance and inhibit blood cell formation. During the time at Walter and Eliza Hall Institute, a solid basis for scientific research was obtained as well as a strong appreciation of basic cell biology. Postdoctoral studies were undertaken at the Dana Farber Cancer Institute and the Harvard Medical School, Boston, in Dr David Nathan’s laboratory where experience was gained in the use of protein chemistry and molecular biology to study growth factor receptors on normal and leukaemic cells. These studies were supported by the award of a Neil Hamilton Fairley Fellowship from the National Health and Medical Research Council of Australia. These studies led to the realisation that a number of growth factor receptors share common receptor subunits. Experience was also obtained in the application of in situ hybridisation to detect colony stimulating factors within tissues. From 1990 to 1996 he was Head of Haematology and Oncology Research at the Royal Children’s Hospital. He supervised and co-ordinated 15 research staff and 6 students. The focus of the laboratory was on Langerhans Cell Histiocytosis and studies on neural-derived tumours. He established productive collaborations with the Walter and Eliza Hall Institute and the McFarlane Burnet Institute, as well as overseas centres. 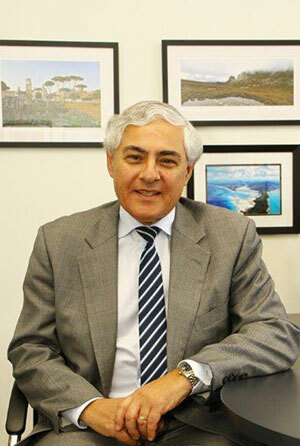 Since 1996 Prof Kannourakis has lived and worked full-time in Ballarat. He helped initiate the establishment of the Fiona Elsey Cancer Research laboratory, based at St John of God Hospital in Ballarat. This was built up over the years to the Ballarat Cancer Research Centre (BCRC), and in 2012 renamed the Fiona Elsey Cancer Research Institute (FECRI). The funds are predominantly obtained from local community support. In 2004 he established a Board to oversee the activities of the BCRC. Currently, FECRI has three postdoctoral fellows, five senior scientists and eight PhD students. The FECRI is well positioned to undertake state of the art research in the field of cancer research. The current research of the FECRI is focused on the aetiology of Langerhans Cell Histiocytosis, Immunology of Cancer and the development of new antibodies to ‘lift the fog’ off cancer cells. He has been a chief investigator in over 30 Clinical Trials. Professor Kannourakis has authorised over 70 peer-reviewed publications.